Phantom dogs, spring-heeled demons and a half-man, half-owl hybrid – these are just some of the strange and mythical creatures from English folklore that have inspired writers for centuries. It was while novelist Sarah Perry was driving through Essex with her husband that she first heard the story of a giant serpent, with teeth “very white and sharp.” The myth of a 9-foot snake which terrorized the county’s cattle had been told for centuries. Inspired, she produced her novel The Essex Serpent, which won her the Waterstones Book of the Year prize last year. The tale of the giant serpent first surfaced in a pamphlet from 1669, which claims its antics were “attested by many credible persons.” Perry, who lives in Norwich says, “It’s a great unsolved mystery. Some say it was all a hoax, a monster that was hand-built by a man and his son. Others say it was a crocodile – some such creature which escaped from the [royal menagerie housed at the] Tower of London and made its way to the Essex marshes.” Regardless of its authenticity, myths and the “dark places that inhabit the corner of your eyes” have always interested her. She is not alone. Another writer inspired by local legend was Bram Stoker. The author of Dracula had his head turned by the legend of the Lambton Worm, which was said to have terrorized the County Durham village by snatching away small children and devouring sheep. He wrote The Lair of the White Worm, published in 1911, based on the myth of the monster, which was described as large enough to coil itself around a hill. It was later turned into a Ken Russell film, featuring Hugh Grant in one of his earliest roles, Amanda Donohoe and an unfortunate Boy Scout. Similarly, Arthur Conan Doyle drew on the story of Black Shuck – the demon dog that apparently appeared at churches in Bungay and Blythburgh in Suffolk during a thunderstorm in August 1577. The animal apparently killed two parishioners and left scorch marks on a church door, and became one of the inspirations for the Sherlock Holmes novel, The Hound of the Baskervilles. It also inspired Essex writer Martin Newell, who wrote a poem named after the dog. He says more and more writers are being drawn to mythology “as society becomes more secular and the younger generation, who never go near a church, are looking for mystery in life. I grew up with the stories of Black Shuck from my granddad. When I was writing [the poem] someone said to me to ‘be careful,’” he adds, with a nod to the grip the story still holds on people. 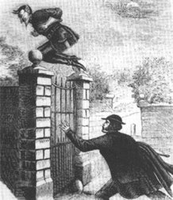 Other demonic creatures immortalized in print include Spring-Heeled Jack (above), who struck fear in the hearts of Victorians. Sightings of the mysterious light-footed man, who could leap 9-foot fences, were recorded from Chichester to Liverpool and were first reported in The Times in the 1830s. Prof Rohan McWilliam, an expert on Victorian culture at Anglia Ruskin University, said popular Gothic fiction turned monsters such as Spring-Heeled Jack into unlikely heroes – partly in reaction to what was happening culturally at the time. “In the 19th Century you had a high tide of rationalism and these horror stories, and these monsters, acted as a counterweight to the rationalism,” he explained. The devilish ne’er-do-well, who terrorized people and chased a gardener, according to a report from 1838, went on to inspire a novel named for him, written by Philip Pullman. While the story is almost 200 years old, the motif of a mysterious, shadowy man continues to be used in modern-day tales. Slender Man, a horror character created on the internet by Eric Knudsen in 2009, is a present-day example of a mythological creature. “The Slender Man is unique only in the fact that he was generated via online forums,” says Shira Chess, assistant professor of mass media arts at the University of Georgia. “This affected the speed of his spread, but not the essence of his story. In many ways, the Slender Man resonates with older styles of storytelling, fairy myths and other modes of folklore.” Jonathan Downes, a director of the Centre for Fortean Zoology, adds that even though it was created in the digital world, the Slender Man bears the hallmarks of old-school folklore and looks likely to influence writers in generations to come. Source: Nic Rigby, BBC News, March 4, 2017. I thought that Arthur Conan Doyle got his idea from the phantom black dog called Black Shuck that haunts a place near an old house called Cromer Hall. Didn't those of you who went to England a few years ago go to Cromer Hall, or somewhere near there?